Why am I reviewing Lucy Bee Extra Virgin Organic Coconut Oil. It has incredible properties and it is very healthy. It is extremely versatile. Coconut oil is a natural oil that will benefit the body in many ways. Coconut oil is made from the flesh of the coconut. Find out how it is made read this article. Use it for cooking and general day to day food preparation. The health benefit is huge and is becoming more and more obvious with the reports and surveys coming out. There is a greater public awareness of the benefits of coconut oil. Some of the benefits of using coconut oil are its free from cholesterol, gluten, preservatives and additives. Coconut oil is good for you because it contains lauric, capric, and caprylic acids. This will also increase your immunity. Other benefits of the oil include antioxidant, antifungal, and antibacterial properties. One factor that makes it so important is the benefits of coconut oil for people suffering from a long-term condition. This includes Alzheimer’s, Parkinson’s and multiple sclerosis. Apparently it helps maintain and improve memory. It is wonderfully nourishing for skin and hair when used as a natural beauty product. To taste coconut oil is very mild. One suggestion is to take 2 tablespoons a day with oats, soup, yogurt, smoothies, protein shakes, coffee, tea, toast and salads. Before the advent of electrical lighting, coconut oil was the primary oil used for illumination in India and was exported as cochin oil. 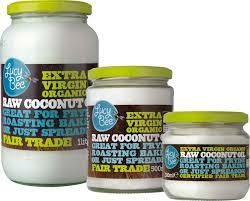 If you have not tried it before now is you chance, buy Lucy Bee Extra Virgin Raw Organic Coconut Oil 500ml . I decided to buy this product because I wanted to experience some of the widely reported health benefit. This has been an excellent addition to my dogs diet and I have noticed significant improvement in his skin and coat. Lovely, soft, tasty for those with deteriorating memory like mine!! I have MS and memory is very bad. Great stuff highly recommend it to everyone.